In a country as hot as Thailand, it's unsurprising that its most popular drinks feature plenty of ice! More surprisingly perhaps is that condensed milk is also a feature of some. Its sweet milkiness helps to combat the heat of the spicy food for which Thailand is renowned. Boil the water and pour on top of the tea leaves (in a teapot or jug). Allow to stand for 2 minutes and then strain. Add the sugar then leave to cool. Fill a glass with crushed ice and add the condensed milk. Pour on the cold tea and stir before serving. Prepare the filter coffee in your usual way. Place the condensed milk in a tall glass. Half-fill the glass with coffee and stir well. Fill the glass with ice and stir again before serving. Break open a coconut and grate the flesh into a large piece of cheesecloth over a bowl. Pour over the water. Squeeze the water and grated coconut together with your hands. Do this for about 5 minutes then lift the cheesecloth up, make a ball of the coconut and squeeze out as much of what is now coconut milk as you can. Discard the coconut and enjoy the drink. A young coconut is pale-coloured and doesn't have the rough hairy covering of an older one. Cut open the watermelon and roughly chop the flesh. Discard most of the seeds. Crush the ice well before putting some in a blender. Whiz it to make a slush. Add the watermelon flesh and keep whizzing and adding ice or watermelon until you have a drink of the right consistency. Serve in a tall glass with a straw. Put the water and sugar in a small saucepan and bring to the boil. Simmer, stirring, until the sugar has dissolved. Set aside to cool. Halve and squeeze the lemons. Put the juice into a jug with the soda water. Add the sugar syrup, stirring and tasting until it's just right for you. Fill a glass with crushed ice and cover with the lemonade. Serve garnished with a slice of orange and a straw. Place the first 5 ingredients in a blender and whiz for 30 seconds. Add crushed ice and blend until you have a slush. Add more ice as necessary. Serve garnished with a slice of pineapple. For an authentic Thai flavour use seeded and sliced fresh jackfruits if available. Jackfruits are part of the mulberry family and can reach 3' in length and weigh up to 75 lbs! We'll finish off with a drink that looks a little bit unusual! Thai Sweet Basil seed drink. For this you need Thai Basil seeds, which are available from Asian supermarkets - or you can grow your own! Stir the sugar into the water until it dissolves. Add the honey and stir. Add the basil seeds and stir. Leave for a few minutes before drinking. The basil seeds will expand and it will look as though you are drinking frog spawn! 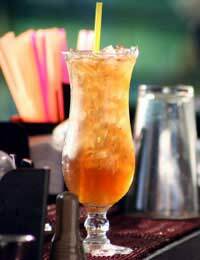 Thai custom says that this drink is an aid to slimming.